After 10 wonderful years, our alpaca adventure is coming to an end. We have enjoyed building our alpaca herd and store, but family changes have led us to decide to sell our alpaca farm. 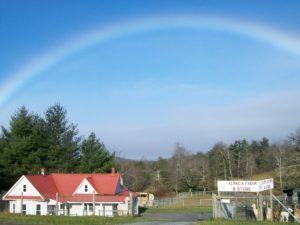 We would love to help you start your new adventure here on a 27 acre farm located on the Blue Ridge Parkway at Milepost 204, currently operating as a thriving alpaca farm and store. Turn-key Alpaca Farm For Sale: We (and our long time customers) would love to see the farm continue as an alpaca farm and store, so we would also be open to selling our business as an established, profitable, turn-key alpaca farm and retail store. Over the years, we have found what has worked well for us, and will be happy to share that information and help you find what works best for you. We have many longtime, regular visitors and friends of the farm from our local region. In addition, our location offers us a unique opportunity to reach the many visitors to The Blue Ridge Parkway. The Parkway, part of the National Park Service, is a 469 mile long scenic highway which receives about 16 million visitors a year and connects Shenandoah National Park and Great Smokey Mountains National Park. We are located near the center of the Parkway just a few miles from the Virginia/North Carolina state line, and easily accessible from I-77 and Highways 52 and 89. Our beautiful, working alpaca farm is located just 9 miles north of The Blue Ridge Music Center, and 28 miles south of Mabry Mill, the most photographed spot on the Parkway. The farm and home is listed with Toni McSwain of Virginia Mountain Realty. You can see pictures and a video tour of the property and home on her webpage (MLS# 57222), and set up an appointment to visit the property with her. Primary Home: 2 bedroom, 1 bath home, 1152 sq ft. Built in 2008, remodeled and doubled in size in 2015. Large open living area (32 x 15′) doubles as a fiber art class space with views of alpacas out every window. Bedroom 1: 16 x 20’ room with large closet, sliding glass door onto 16 x 10’ deck, and 3 large windows. Easy access to large storage area in attic above bedrooms. Bedroom 2: 16 x 12’ room with closet and 2 large windows, could also be used as an office. Bathroom: 10 x 5’ room with large storage closet, deep Jacuzzi bathtub, deep utility sink with washboard. Electric utilities: on demand hot water, stove, refrigerator, washer and dryer area. Wood stove heats the home wonderfully. Passive solar design also keeps home warm in the winter. Ceiling fans and open design keeps the home cool in the summer. 32 x 9’ storage shed & utility room attached to back of house. Second Home/Store: Approximately 100-year-old, 5 room, 1 bath building with full attic for storage. Currently being used as an alpaca retail store with paved driveway and 4 car paved parking lot (additional store parking space on grass, Misty Trail and near barn). Previously used as a summer cabin. Gas fireplace and gas heater. Gas hookup for stove (not currently in use). Electric water heater in small basement area. Barn: 40 x 40’ barn with 6’ covered overhangs on two sides. Built in 2006. New metal roof in 2016. 10×30’ stall on one side, 10×20’ stall on other side; both can be divided into smaller areas, and include built in hay feeders, ‘stall skin’ floor coverings, bars for grain buckets and hooks for water. 10×10 insulated stall. 10×20 foot hay storage above workbench and storage area. Additional 10×20 hay storage area that can stack from floor to ceiling. 20×30’ area in center of barn perfect for classes, equipment storage, or working with animals. Interior lighting in barn, water faucet on southeast side of barn, electric to stalls, work bench, insulated room, and wired for a motorhome. Designed for alpacas, but suitable for many other animals. Pastures: 10 acres fenced in with 5 foot 2×4” no climb wire, divided into 14 pastures with access to shelters, cross fenced with 4’ or 5’ fencing. 9 sheds in the pastures in addition to the barn, 5 sheds include enclosed hay storage. Designed to increase options for pasture rotation. Again, our farm was designed with alpacas in mind, but would work well for other livestock. Water: Well, installed in 2008, serves primary home and barn. Spring and pump located in historic springhouse serves store. Workshop: 10×15’ workshop located behind the store. Workbench, cement floor, door and two window openings with shutters, vented for blacksmithing. Garden: Berry and Asparagus garden with established blueberries, asparagus, raspberries, thornless blackberries, and strawberry beds. Primary entry to farm from Misty Trail, County Road 608, which runs parallel to the Blue Ridge Parkway. Farm has approximately 1,100 feet of frontage adjoining the National Park. Sign, store and front pastures of alpacas are visible from the Parkway and Piedmont overlook at Milepost 204. Primary home has limited view of the Parkway and neighboring farms, but extended view of the Blue Ridge mountains, primarily trees and rolling hills to the west. Additional entry to the rear of the property is through an easement road from Round Hill Rd, allowing for easy access to primary home and other prime building locations on back of property. There are multiple springs and creeks on the property, with adjacent areas suitable for picnic areas or walking trails, also several acres of sparse woods that could be easily converted to pasture.